This article explores how RFID has matured in the last several years, and examines the fundamentals that make it a potentially high-growth opportunity. Most investors would be surprised at the changes since the Walmart era, and those who know the status may find profit opportunities. RFID is a good investment for technology investors, with many status lights now green for “go.” Users were disappointed after the circa-2005 RFID industry proved unable to deliver on hyped benefits. Founded mainly on a single application and driven by a small, Walmart-led coalition, the movement was left in disarray when Walmart retreated. The 2008 recession quashed attempts at a recovery, and disappointed investors went elsewhere. But the last two years have been busy ones. In this article we discuss ‘green lights’ indicating a diverse revenue base, an exponentially growing killer app, a well-coordinated ecosystem, an active climate of innovation, and strong ties to the explosively growing Internet of Things. (See Figure 1.) We see mainly green, a few yellow and no red lights – most investors would be surprised at the changes since 2005, and those who know the status may find profit opportunities. Yellow lights, explored in the sidebar, include RFID’s strong reliance on the retail apparel segment and the potential commoditization of hardware. On balance, we expect opportunities for thoughtful investors thanks to solid growth for the rest of the decade. 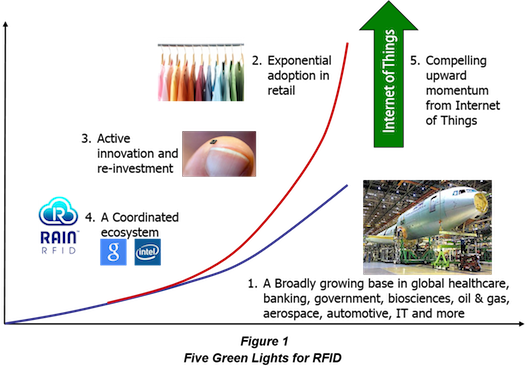 Despite its ubiquitous presence in virtually every vertical, RFID today owes its exponential growth curve to a single application in a single vertical. While there are many users applying RFID in diverse applications in dozens of industries, only the retail inventory management application has achieved significant economies of scale. This application drives much of the rapid growth in UHF RFID over the next few years. Investors who are counting on continued exponential growth rates may be vulnerable to unforeseen impediments. We believe the risk is low, as the business case for retail adoption (for high mix complexity, high margin items) is so compelling, and there are many seeds planted for the next killer app. Yellow Warning Light #2 – Will Retailers Tag General Merchandise? Perhaps 100 billion apparel items are sold at retail every year, with many more in hundreds of categories and sub-categories. Among the first to be tagged were “men’s basics,” or underwear, and denim. These categories not only meet a minimum gross margin threshold, but also have the key attributes of high SKU variability and high replenishment requirements, meaning that RFID has the potential to boost revenue simply be protecting against stockouts that would lead to lost sales. But many non-apparel categories such as cosmetics, jewelry and certain housewares have similar characteristics, significantly increasing the total number of taggable items. A key growth factor will be the rate at which other retailers follow Marks and Spencer to tag non-apparel categories. Investors should also watch for adoption by specialty retailers like jewelry stores. This will be accelerated by the availability of complete, turnkey solutions for certain categories. For example, Hong Kong-based Convergent Systems Limited (CSL) offers a complete jewelry-store solution for about $7,500, which they say they can deploy in a day. While the 30,000 jewelry stores or departments in the United States suggest opportunity, as of now, the rate of adoption in categories beyond apparel is an unknown. During the Walmart mandate years, the RFID industry promised future inlay pricing of 5¢ for an RFID inlay, the most basic, fully functional element inside a complete tag. Customers have been pining for that price ever since. While the highest volume contracts have recently cracked the 5¢ threshold, average selling prices aren’t there yet, and price continues to be one of the two top priorities. Since the UHF Gen2 standard was ratified in 2004, the only chips and tags capturing market share are those that have pushed limits in cost and sensitivity; the market has had little interest in feature-based differentiation so far. Similar price pressure has reduced reader and reader chip prices by more than 50% since Walmart, and we forecast further declines for the next two years. The RFID industry will need to grow rapidly to outpace these trends and maintain margins for chip, tag and hardware vendors. Investors should look for vendors that add more value to their chip, tag and reader offerings to hedge against this risk. Vendors delivering more of the complete solution will be better able to protect margins and drive volumes. Successful chip and tag vendors will bundle their products with service offerings like encoding, authentication, printing, and cloud-based device connectivity. Avery Dennison, for example, has a well-established “service bureau” offering for retailers to help maintain margins and share. Successful reader vendors will leverage domain knowledge to deliver more complete solutions, as Tyco has at Zara. Chip, tag and reader vendors who just ship naked widgets will see their margins and market share shrink. First, RFID has established a solid and diverse base across multiple verticals. Retail drives headlines, but system integrators have their heads down installing RFID systems in healthcare, government, oil and gas, manufacturing and more. The RFID industry today is not dependent on one initiative nor one large company, but is growing from a diversified base. Growing on top of this base is retail inventory management. One of many potential applications of RFID in retail, inventory management has the advantage of being straightforward to implement and packing a well-established financial punch. The most basic implementation simply involves substituting handheld RFID readers and tags for barcode in the counting process. Because employees can read RFID tags 25 times faster than barcodes, the labor savings alone is significant. However, the resulting improvement in inventory accuracy reduces lost sales due to stockouts, delivering a revenue increase of several percentage points, and an investment break-even of a few quarters (for more see “The Retail Revolution and Why Now for RFID”). RFID can help drive accuracy from the abysmal 60%-70% range that many retailers now live with to over 98%, making it a key asset in deploying omni-channel systems, brick-and-mortar’s answer to Amazon. Retail inventory management is the biggest driver of the 40% year-on-year growth we are predicting for the next two years, which lead to the first of our yellow lights (See Yellow Warning Light #1). Macys, Zara, Kohl’s and Marks and Spencer are among the retailers to have begun commercial roll-outs in the last 24 months. Marks and Spencer is the only large retailer that has gone significantly beyond apparel, having recently announced that it will tag all general merchandise, requiring 400 million tags per year. This lights up another yellow indicator (See Yellow Warning Light #2). Like many promising technologies, RFID has had to work through intellectual property issues and standards battles. Most recently, in 2012 Round Rock Research filed claims against end users alleging patent infringement, dampening enthusiasm and momentum among end users. However, by the beginning of 2014, Round Rock Research had announced that 90% of tag vendors and 75% to 80% of reader vendors had signed licensing agreements, unburdening the industry and triggering a new round of deployment. Standards issues are a distant memory as well, with the EPC Gen2 specification being mature, stable and now harmonized across standards bodies via ISO 18000-63. 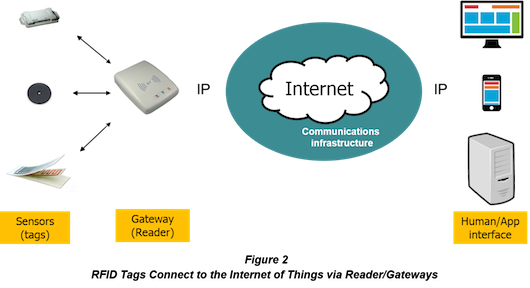 Readers and tags are highly interoperable, with incompatibility issues being virtually unheard of. Despite that, new products supporting the recently ratified version 2 of the specification, known as Gen2V2, could introduce interoperability challenges due to the large number of optional features. Fortunately, the industry stands ready to head off problems thanks to the recent formation of the RAIN Alliance (RA dio-frequency IdentificatioN), whose charter includes interoperability testing. Innovation in UHF RFID is accelerating in multiple areas, including: cost, performance, security, software and financing models. In this post we’ll cover cost and performance. The total applied cost of an encoded tag is the benchmark for the cost of RFID. It’s not just the chip, but also the cost of attaching the chip to a substrate to create an inlay,1 the cost of encoding and printing the tag and, finally, the cost of applying the tag to a retail item. Chips cost perhaps 1¢ to make, and yet by the time an RFID-enabled swing-ticket hangs from a blouse in Kohls, the cost of tagging has swelled by more than 10X. There is opportunity for cost reduction at every stage. An example is the recently released Impinj Monza R6 tag chip. The new chip eliminates metal “bumps” that other chips use to establish electrical contact with the antenna, replacing them with large metal pads. These pads have two beneficial impacts on the manufacturing process. First, they reduce the precision required in positioning the chip on the antenna, relaxing manufacturing tolerances and boosting yields. Secondly, chips without bumps are less likely to crack when processed in label-making equipment and printers, improving reliability and reducing rework all the way to the retail floor. Another example improves in the state of the art for the manufacture of inlay antennas. Most inlays available today use antennas made from aluminum foil laminated to a flexible plastic2 substrate in a wasteful process that uses chemical etching to remove the excess aluminum. Market leader Avery Dennison and smaller innovators Tageos and Walki have deployed new methods that replace the plastic with paper and the etching process with laser die-cutting. Excess aluminum is rolled up and recycled. The process reduces costs associated with the bill of materials, process steps, the environment and manufacturing cycle time. These and a variety of other cost reduction efforts have the potential to drive adoption while preserving margins, but to do so they have to outpace downward price pressure (see Yellow Warning Light #3). Tag sensitivity has long been a key success factor for new RFID applications. The percentage of successful reads or, conversely, the range over which a tag could be read often determine whether an RFID application can deliver the necessary ROI. Chris Diorio, CTO of Impinj, recently made what he called a “risky prediction:” over the next decade, tag sensitivity could improve by as much as 8 decibels (dB), which, if readers keep up, could improve range by a factor of 2-1/2, or, alternatively, enable smaller, less expensive tags. This would enable many new applications, increasing volumes and further improving economies of scale. RFID is a good investment for technology investors, with many status lights now green for “go.” In the last few years the industry has built a diverse revenue base, fielded a killer app, created a healthy ecosystem and established strong links to the Internet of Things, a key nexus of technology innovation and investment. Investors would be surprised at the positive changes since the Walmart era, and those who pay attention should find profitable investment opportunities. This RFID series continues in the next issue -- RFID: Are We Really Out of the Engineering Stage?.